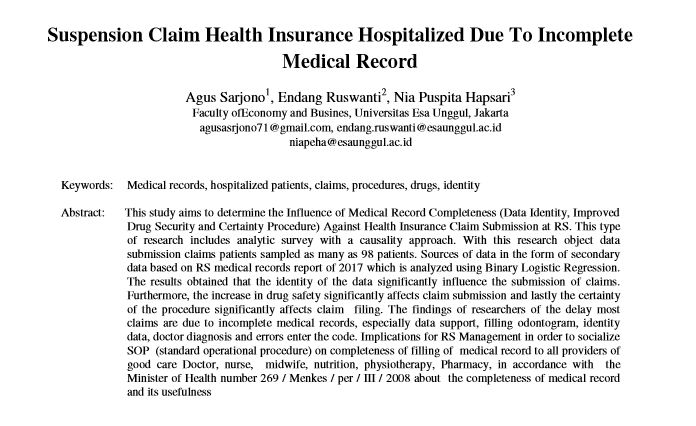 This study aims to determine the Influence of Medical Record Completeness (Data Identity, Improved Drug Security and Certainty Procedure) Against Health Insurance Claim Submission at RS. This type of research includes analytic survey with a causality approach. With this research object data submission claims patients sampled as many as 98 patients. Sources of data in the form of secondary data based on RS medical records report of 2017 which is analyzed using Binary Logistic Regression. The results obtained that the identity of the data significantly influence the submission of claims. Furthermore, the increase in drug safety significantly affects claim submission and lastly the certainty of the procedure significantly affects claim filing. The findings of researchers of the delay most claims are due to incomplete medical records, especially data support, filling odontogram, identity data, doctor diagnosis and errors enter the code. Implications for RS Management in order to socialize SOP (standard operational procedure) on completeness of filling of medical record to all providers of good care Doctor, nurse, midwife, nutrition, physiotherapy, Pharmacy, in accordance with the Minister of Health number 269 / Menkes / per / III / 2008 about the completeness of medical record and its usefulness.